Immunotherapies have been gaining in popularity in the last few years as a potential treatment for cancer. The idea is to use a patient’s own immune system to reject tumorous growth, either by vaccination, injection of substances that stimulate immunity, or cell transfer. T cells are a subset of white blood cells, which can specifically recognise and destroy virally infected or cancerous cells. This recognition is done via their T cell receptor. This receptor is designed to interact at the molecular level with proteins on the surface of all cells. If the T cell receptor is compatible with a given protein, binding occurs, which means the two cells become attached. The T cell receptor can recognise proteins on target cells with sharp discrimination. If the protein is of the “self”, binding does not occur and the T cell does not react. 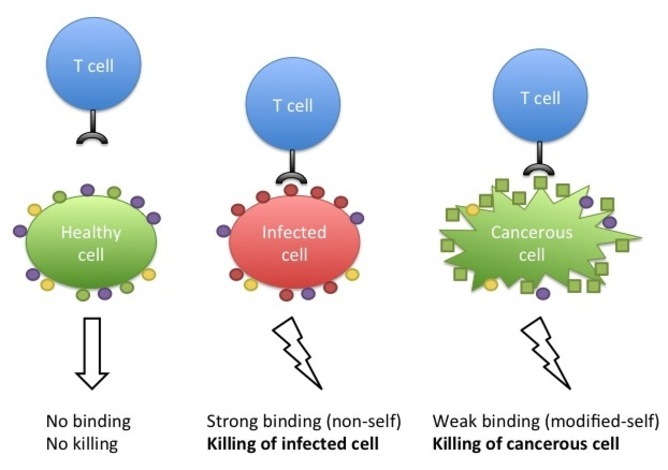 If the protein is a viral protein, or a modified self protein in a cancerous cell, strong binding induces the T cell to destroy the abnormal cell. T cells&apos; importance in tumour control was recently highlighted, when it was observed than patients whose tumours were highly infiltrated with T cells had a better prognosis. But how can we increase the amount of T cells in tumours of patients with poor prognosis? 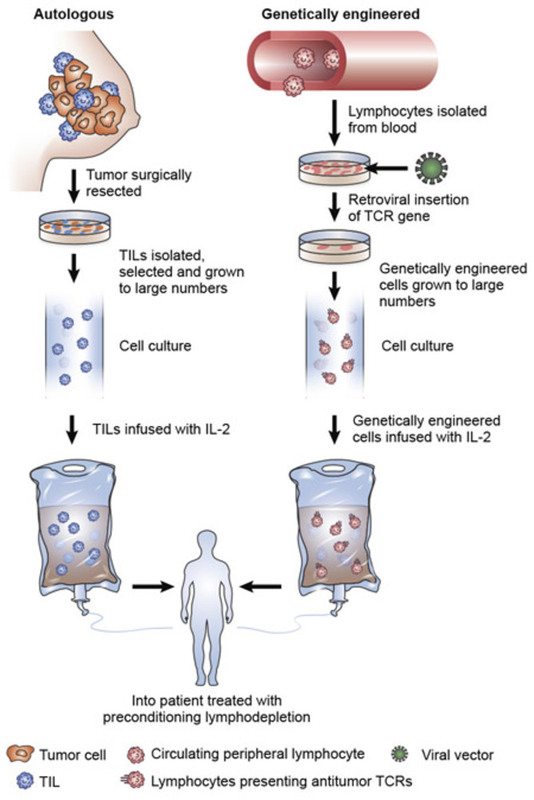 Since T cells circulate in the blood, it was imagined that T cells could be extracted from the blood and transfused into cancer patients, as a cellular therapy. However, for an efficient anti-tumour effect via transfer of immune cells, one needs to select the right cells. Since a T cell receptor can bind proteins on the surface of other cells with high specificity, it can discriminate between billions of proteins. This means that there are only a very small percentage of cells that bear the correct receptor for a given protein. To try to find such a specific immune cell in the blood to target a specific cancer would be as hard as finding a needle in a haystack. To solve this problem, researchers have found a way to extract T cells from tumours excised by surgery and then to expand them in vitro in the lab. Liberated from the deleterious tumour environment, and carefully looked after in their petri dishes, the T cells are able to expand to numbers more favourable for making an efficient therapy. They can then be transfused back into the patient together with a T cell growth factors (which stimulate cellular growth). This technique has shown great promise in metastatic melanoma where patients, having failed all standard lines of treatment, showed remarkable responses to cell transfer therapy: 50% of those treated had an improvement in their disease, while 20% showed long-term remission (five years or more). Adoptive cell transfer in action. So far so straightforward. Unfortunately, retrieving immune cells from tumour tissue is not a trivial process and, clearly, is impossible for cancers that are not accessible by surgery. Moreover, T cells which recognise cancer cells are typically less potent than, for example, virus-specific T cells, because they have low-affinity T cell receptors. This is because cancer cells are non-foreign self-cells and the immune system has evolved to avoid reacting strongly against this kind of tissue to avoid autoimmunity – essentially to prevent it from attacking itself. Hence, it was proposed to genetically modify T cells from the blood of cancer patients, to confer potent but highly specific recognition of cancer proteins. This is feasible, since stable genetic modification of many cell types can be efficiently and safely achieved through modern genetics technology. It is possible to mutate naturally-occurring T cell receptors to achieve a higher protein-binding ability, and even to be more creative and design new receptors that are superior to those found in nature. The chimeric antigen receptor (CAR) is an example of this. It is a synthetic protein which contains components of both an antibody and a T cell receptor. Expression of CARs in T cells results in a strong recognition of tumour proteins, just like an antibody, and highly specific destruction of tumour cells. CARs have proven extremely effective in the treatment of blood-borne cancer. For example, in treatment-resistant leukaemia patients, CAR therapy can induce durable remission, as published by the laboratory of Carl June in 2011. Numerous similar studies have since followed, with very promising results. However, leukaemias are relatively easily and safely targeted based on their location in the body (the blood), but this is not the case for most solid tumours such as melanoma (skin) and carcinoma (tissue) cancers. The main problem with T cells and their exquisite specificity is that one has to be aware of the appropriate tumour protein to target. Additionally, tumours evolve rapidly and often stop expressing proteins which are targeted by the immune system. However, this might not be a problem if the therapy acts fast enough, or targets an antigen that is necessary for tumour survival. Finally, there could be dramatic consequences if the antigen is expressed in other parts of the body. For example, a recent report described a patient who lost his life after adoptively transferred T cells that were specific for a tumour antigen started attacking tissue cells in the lung, where low levels of the targeted protein were expressed. Such adverse events are difficult to predict since antigens may be expressed by normal tissue cells at certain times or under certain conditions. To address this safety issue, scientists have created so called “suicide genes”. These genes can be added to the T cell at the same time as it is genetically modified to express the tumour-specific receptor. Consequently, it is possible to induce rapid T cell destruction upon treatment, in the event of a dangerous autoimmune response. Immunotherapies in general, and adoptive cell transfer specifically, hold many promises for the future of cancer treatment. The field is developing at breakneck speed, and many studies are currently being made to identify new cancer-associated proteins to target and additional safety mechanisms to prevent autoimmunity upon transfer of T cells. In cancer science, this is certainly one field to watch closely. Gwennaëlle Monnot is PhD student in Immunology and Cancer Therapy at University of Lausanne.